Sometimes you run across a kitchen item you know will make you smile every time you use it. Either it makes preparing food much easier, or makes you laugh and adds more enjoyment to kitchen routines. Check out the items below and see which ones should be on your kitchen fun list. Who doesn’t want perfectly peeled hard-boiled eggs? It’s a lot harder than it looks, and you definitely don’t want to take deviled eggs to a gathering with unsightly gouges in the egg whites. Fortunately, there’s a hard-boiled egg peeler called the Negg that allows you to slide the shell off easily without leaving any marks. It’s a plastic cup (4 x 3.1 x 3 inches) with a lid, and comes in a variety of colors. 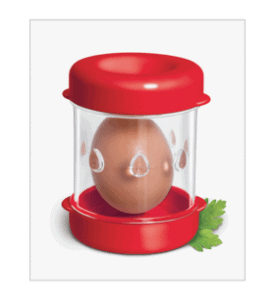 All you do is add a little water, and your boiled egg (cooled in an ice bath or the fridge), secure the lid, and shake the Negg up and down 4-12 times with enough force to cause the egg to strike the top and bottom of the cup. Then remove the lid and egg, and the shell should peel off easily. Now all your hard-boiled eggs can be peeled cleanly and without damage. The dipr cookie spoon is a white hook on the end of a colored handle that allows you to dip a sandwich cookie into your milk, tea, or any liquid of your choice. The hook cradles the cream between the cookie layers and prevents the cookie from crumbling. It even works with double stuffed cookies. Once you’ve dunked, you can eat the cookie right from the tool so your fingers don’t get sticky. The handle comes in a number of colors, so each family member can have their own “dipr”. With this tool there’s no need to lose cookies in your glass or mug ever again. Many people enjoy eating corn on the cob the traditional way — right off the cob with butter dripping down their chins. However, children and people with dentures, partials, and braces find corn on the cob difficult to eat. This is when a corn peeler comes in handy. You have the convenience of eating canned corn, with the nutrition and deliciousness of freshly cooked corn on the cob. Just place the peeler (looks like a round flying saucer with a hole in the middle) on the narrow end of the cob, and push straight down. Stainless steel blades inside strip the kernels, which are collected in the peeler’s basin. These blades adjust to the width of the cob. Empty the basin, and repeat the process with another cob. The basin can hold about two ears worth of kernels. Everyone can now enjoy corn on the cob. It’s frustrating trying to butter bread, whether toasted or untoasted, when the butter’s just out of the fridge. You either tear the bread, or leave unspread clumps on its surface. One solution is to leave butter out all the time in a butter dish. However, if you don’t use it up quickly in a day or two, it can take on a rancid flavor and odor, especially in warmer temperatures. Perhaps a better solution is a heated butter knife that allows you to spread “cold” butter smoothly on your bread, bagel, or English muffin. One such butter knife uses a built-in, rechargeable lithium-ion battery to provide a low-grade heat. It takes no more than 3-4 minutes to heat up to 167°F. Then you just hold the knife on the butter (or cream cheese) for five seconds so it melts and you can slice through it. Another type of heated butter knife has a serrated edge that softens the butter so you can shave off fine curls onto the toast. You then use the blade to smoothly spread the curls over the surface. No battery or charging is required with this model. Instead, it transfers the body heat from your palm to the edge of the blade. You only need to hold the blade for about 30 seconds to reach the temperature required to spread butter. Chopping herbs can be tedious and time-consuming. If you want to have some fun cutting herbs, try a pair of 5-blade herb scissors. Not only do they save time, but they allow you to mince, dice, or snip herbs easily, without crushing them or causing flavor loss. The cuts will also be more uniform, making professional-style garnishes for salads, pizzas, soups, and side dishes. You can actually use the scissors directly over the dish you’re preparing so the herbs are as fresh as possible for serving. And the scissors are perfect for quickly adding herbs to your morning smoothie. These 5-blade scissors are versatile as well — use them for arts and crafts, for paper shredding, and for making ticker tape. You’ll want to eat even more eggs just so you can use this Nessie egg cup.Mi It’s a miniature Loch Ness monster for serving soft and hard boiled eggs. You can also cook your eggs in Nessie. Place the egg in the cup, and lower Miss Nessie into a pot of water. The feet will keep her in place while the egg cooks. You’ll be bringing a myth to life in your very own kitchen. This should be on your list if you don’t like lingering food odors on your hands. The Rub-a-Way Bar removes onion, garlic, fish, and other strong food odors when you rub it between your hands under water for 30 seconds. The bar is made from light-weight stainless steel. Molecules in the steel bind with sulphur molecules on your hands, transferring the molecules and the smell away from your hands and onto the metal. The bar is a scent neutralizer only, and you will still need to use soap for proper cleaning. This mug is definitely for you if you love cookies with your coffee or tea, and want to store them for later. This is a 12 ounce mug, with a slot on the bottom to hold cookies, brownies, or any other treats that fit. Of course, your kids will want to borrow it for hot chocolate, milk, or juice, and to hide Mom’s homemade cookies. In fact, you may have to buy more than one of these mugs if you ever want to have one yourself. Kitchen gadgets can be useful items. But the most important items in your kitchen are your major appliances. Call C&W Appliance Service at (855) 358-1496 or (214) 358-1496 for repair and maintenance service you can count on.